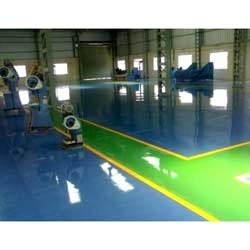 We are a prominent firm, engaged in providing Epoxy Floorings. The experts of our firm make use of supreme grade material to enhance the looks of clients 'place by flooring. Flooring provided by our experts are world class and are widely appreciated for their splendid finishing, resistance to heat & chemicals, longer service life and smooth surface. In addition to these, patrons can avail the benefits of these flooring from us at market leading rates. On offer from us is a range of Epoxy Floorings (Hi Tech), which is known for having excellent resistance against heat & chemicals. These are ideal to be used as protective coating for concrete & steel in pulp mills, secondary containment areas, chemical plats, effluent treatment plant, water/waste water treatment plant, gas & electric utilities, battery rooms and many more places.